"Firestar know that snowfall would bring more problems to the forest. Prey would die in the cold, or huddle deep in the holes where hunters could not follow. It would be harder than ever to feed the clan. His apprentice was watching the falling flakes with wide eyes. Firestar saw him reach out one paw tentatively to dab at one of them. A heartbeat later he was leaping and whirling with high-pitched mews of excitement, as if he were trying to catch every flake before it reached the ground. Firestar was surprised by a rush of affection. It was good to see the young cat playing like a kit again. 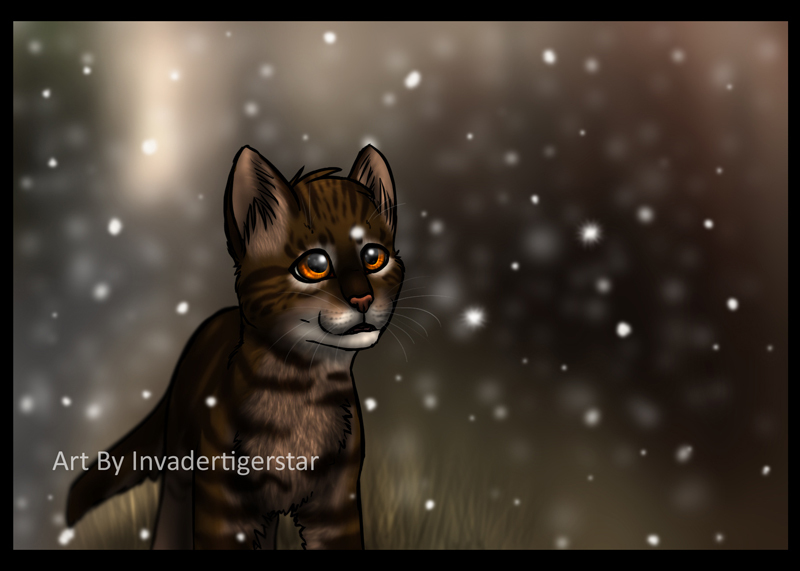 Surely the dark-hearted Tigerstar had never snowflakes just for the joy of it? Or if he had, when had he lost the joy, and begun to care only for his power?" This happens while Firestar and Bramblepaw are out patrolling by the thunderpath. I'd had the idea for this picture for several weeks and finally decided to do it. I am immensely pleased with it. Please do not use this for anything. aww soo cute!!! Bramblepaw/Brambleclaw is beautiful!!! ^^ I won't be putting up a ton, just fan art and the best of my other pictures.